New Years Resolution: Hair Care! Hair care can sometimes seem like a daunting duty, however hair care is not only essential but it can take just a few steps added to your weekly beauty routine. A hair care routine will ensure that no matter what hairstyle you choose your hair will always look healthy and beautiful. Washing your hair can strip your hair of natural oils and leave hair extra brittle. Ideally you should wash your hair 3-4 times a week. Its hard to break the habit of washing your hair every day but try putting your hair in an up-do or a braid for a day to avoid having to wash it. Another great alternative is dry shampoo. 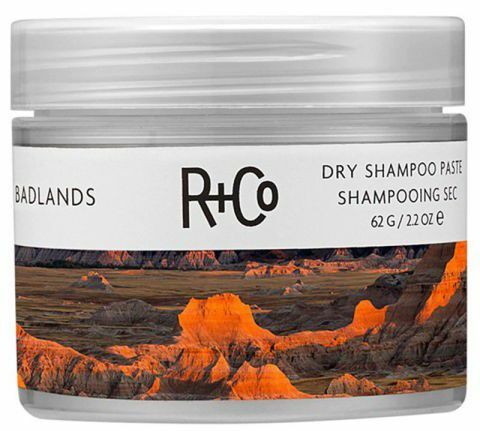 Here at the salon we carry R+Co Badlands Shampoo and it is a hair care dream! Cutting your hair can be a traumatizing experience, especially if you are trying to grow out your hair, however it is crucial to growing out beautiful and healthy hair. It is recommended that you get your hair trimmed every 6-8 weeks. Don't Slack! Regularly trimming your hair prevents split ends and fly always providing for shinier and thicker hair. This will make the hair appear to grow faster because the hair will break less and allow for your hair to grow longer in a shorter amount of time. Consider scheduling appointments ahead of time every time you visit your hairstylist to help keep you on a healthy hair schedule. Not only does a detangling brush make brushing your hair more enjoyable its prevents breakage when brushing your hair. Also a detangeling brush is specifically designed to gently detangle efficiently but also capture shed hair while minimizing damage done to the hair. If you use a curling iron, straightener or blow dryer daily make sure to keep your hair protected. Heat can be very damaging for hair. In addition to protecting your hair with a heat protectant product considering allowing your hair to dry naturally as often as possible or perhaps scheduling one day a week to have a heat free hair day. Here at F&C we carry R+Co Park Ave Blow Out Balm. Park Ave coats the hair to protect it and contains light hold for a little bit if body. If you are chronic top-bun kinda of gal considering changing up your hairstyle once and a while. While a top bun will always be the best look for effortless/chic it can cause damage to your hair if you are wearing it one way most days. Changing up your bun or ponytail can allow for your strands to recuperate and stay strong. Invest in good hair tools. Although high quality hair tools can cost significantly more that average hair tools the cost is totally worth it. Not only will quality hair tools make a significant difference in the outcome of your hair they will last you a lot longer. Metal plates are extremely damaging to the hair; instead, opt for a curler and styler made with either ceramic or titanium plates. So there you have it! A handful of tips for healthier, shinier and all around fabulous hair.